Accommodations: House with 3 Bedrooms and convertible beds, 2 Bathrooms. Sleeps 6. 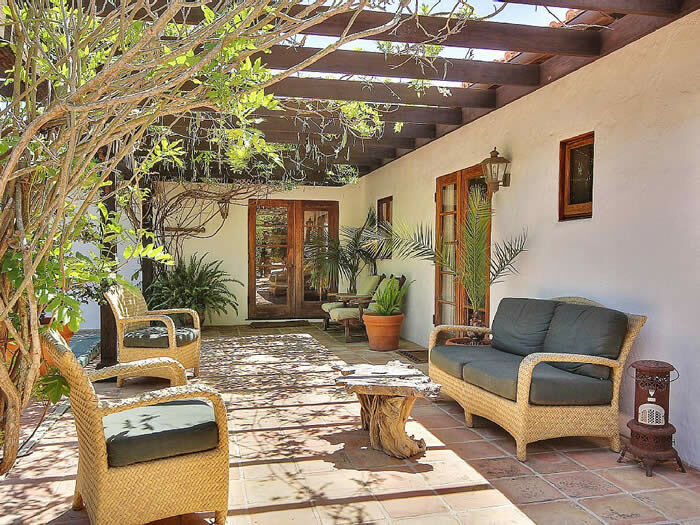 Style and charm abound in this Old World, 3-bedroom, 2- bathroom Spanish-style home, located on a private lane in the heart and soul of upscale Montecito. The house offers dining room mountain views, a courtyard with sculpted water fountain, and a charming living room with fireplace. The master suite is adjacent to a tiled outdoor Jacuzzi, and the master bathroom features a spa tub and secluded garden view. 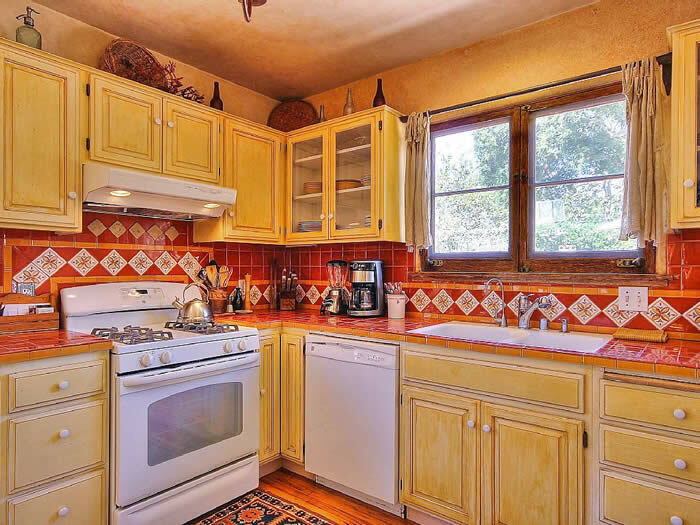 The fully equipped kitchen has recently been remodeled with tile countertops. 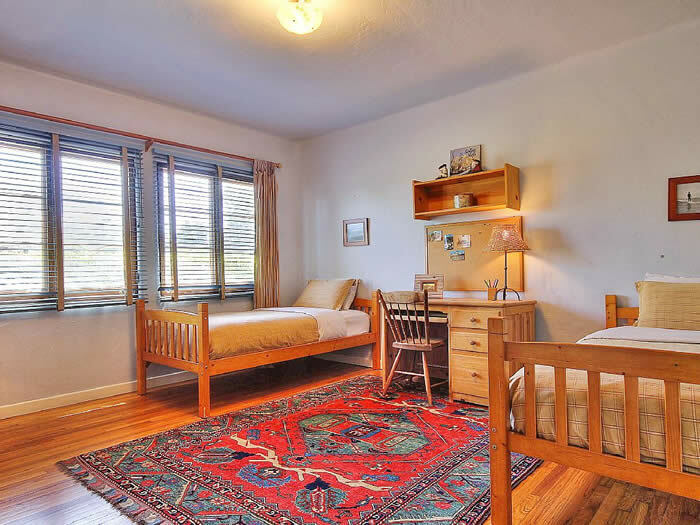 Hardwood floors throughout the house are accented with 12 authentic, hand-made oriental rugs. The large outside entertaining patio with Argentinian-style adobe fireplace and grill is perfect for al fresco gatherings. A round teak dining table seats six on cushioned chairs. Enjoy mountain and treetop views while you dine, accompanied by a chorus of birds. One-of-a-kind art pieces collected from around the world enhance the ambience of the estancia. This beautiful gated property was built in 1927 and features stunning, elegant iron-worked front security gates made by renowned international artist Flavio Bisciotti. They blend harmoniously into the 10-foot high hedgerows surrounding the property, offering welcome seclusion for guests. The landscape was originally designed in 1978 by top Santa Barbara landscape architect Sydney Baumgartner. It has been completely renovated according to the original plans, allowing you to enjoy the enthralling beauty of the stunning Old World garden design, surrounded by fruit trees and flowers all year round. 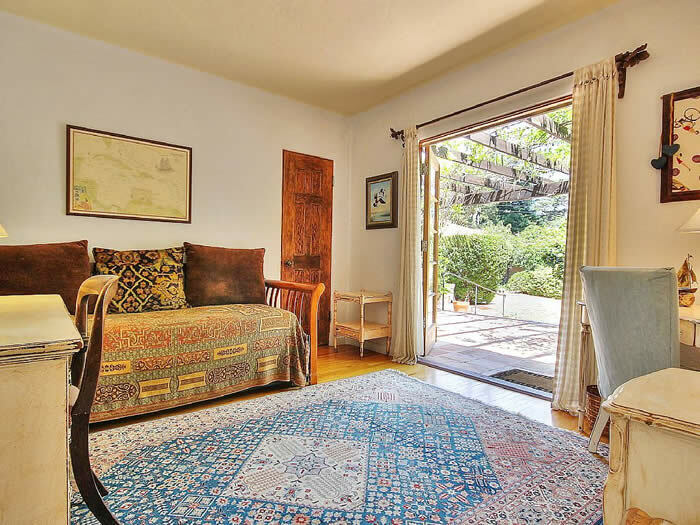 The back of this fine property is connected through a private door to the most beautiful, picture-perfect small park in Montecito. Guests have direct access to an idyllic and secluded wonder, full of creeks, old-growth trees, and a tennis court and playground. Immerse yourself in the grand past of Montecito as you stroll the lushly planted pathways. 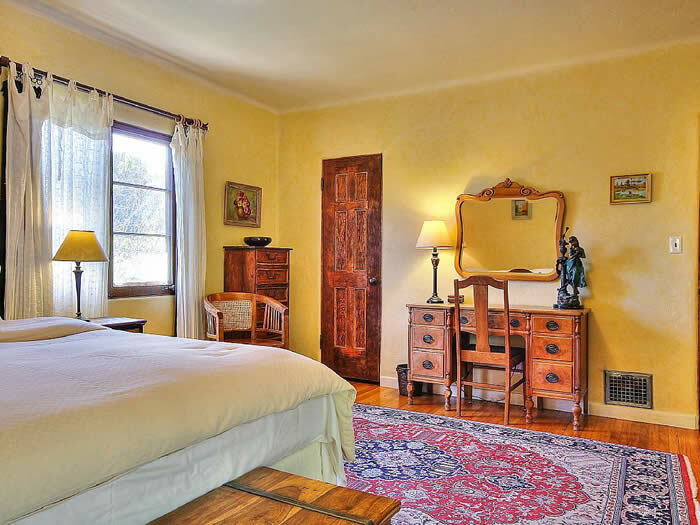 This unique Spanish home is in a premier location, just one block from prestigious Upper Village, restaurants, coffee shops, high end boutiques, gift shops, bookstores and more are less than a five-minute walk from the Estancia, up a gorgeous, quiet, tree-filled private lane. This area is considered a bird sanctuary, just two and a half miles from the Andree Clark Bird Refuge featuring two hundred species of birds. From the Estancia it is just one mile to Miramar Beach and 1.5 miles to the historic Coral Casino and Five Star Biltmore Hotel on Butterfly Beach. The Casa de Maria retreat center is 1.5 miles away. Nearby is the prestigious San Ysidro Ranch, where President JFK and Jackie honeymooned in the 1950’s. 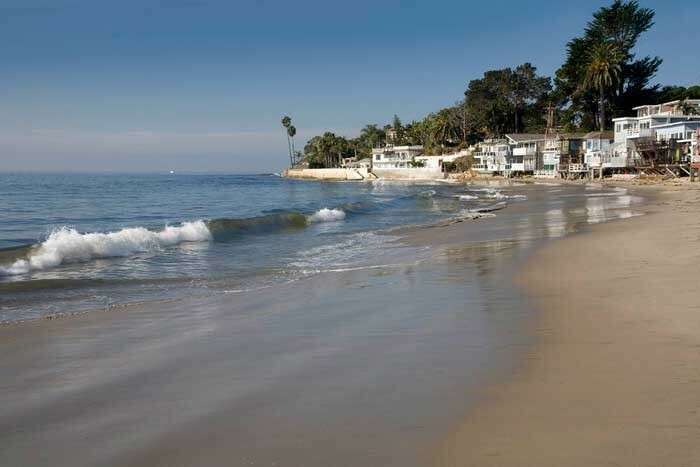 Its less than five miles to downtown Santa Barbara’s incomparable restaurants, shops, wineries, museums, and theaters. • Owner Managed & Operated! Lots of birds for bird watchers lovers. The Estancia has a table tennis. Not one but three lawns to relax. Located right behind the property. Even better than the pictures!!! Enter the gate and you enter into a secret garden and a beautifully maintained Spanish style home. We went with our three kids who enjoyed the spa and basketball court. We entertained guests for dinner on the beautiful patio and enjoyed the living room at end of day...do yourself a favor and stop researching the other Montecito spots...you found it! its this one! Jon M.
Nice get away - but pictures are not a truthful reflection of the property. Owner response: Dear Hege and Joe, Thank you very much for your review and we are happy to hear that you overall enjoyed your stay. We are truly sorry that you feel deceived due to pictures and we want you to know that we had definitely no intention to do so. There were 3 pictures out of 24 that showed the lawn as it used to be before the drought and they were in need of updating. Thank you very much for pointing it out. Please know we took care of it right away . The rest of the garden is kept and maintained as usual and plans for a more drought resistant landscape are being made. Montecito has strict regulations in place and we would like to thank everyone for their understanding. Happy travels! My husband and I stayed at Estancia for 6 glorious weeks. We enjoyed Christmas with my two daughters and their husbands. We loved every minute of the stay. The house suited us very well and the ability to open the doors to outdoor living was fabulous. The location is ideal and we felt as if we were locals spending many coffee and wine hours at Upper Village! The park behind the house was just one more plus to an already perfect setting. The owners being so close was also great as they responded immediately to a few problems. We look forward to returning! Pamela O. We stayed at la Estancia for my son's UCSB graduation with our group of 3 generations and we had a wonderful time! the place is immaculate and beautiful! The grandparents kept on talking about how amazing this place is! The grounds are so beautiful with all the fresh flowers and fruit trees. The owners were very friendly and responded right away when we called them about a small glitch with the patio warmer. We loved sitting outside and enjoying the grounds. We definetely recommend this place and would love to come back again soon! Midori d.
My wife and I rented Estancia for most of the month of January 2014 and had a wonderful time. 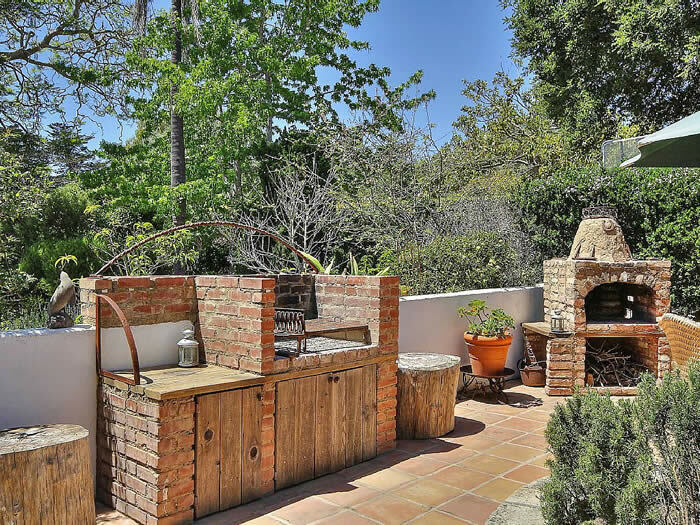 Estancia is a charming 1920's Spanish Bungalow in an absolutely prefect location in Montecito just minutes from everything one would want to experience everything Santa Barbara has to offer, including the beach shopping restaurants, hiking, tennis. The home is situation on a beautiful walled in piece of property than gives you total privacy and solitude. The owners are a lovely couple who we became very friendly with almost immediately and could not be more gracious and helpful. We plan on returning again and again because I seriously doubt we could find anything as good in the area for the price. I give the home and the overall experience 5 BIG STARS!!! Dave K.
While planning a trip to Santa Barbra to celebrate a milestone birthday, my husband and I stumbled upon Sabine and Claudio’s Montecito Estancia online. From the images, the Estancia looked nice. However, upon arrival, we opened the gate and immediately discovered that the images, while helpful, did not present the whole, wonderful picture. Montecito Estancia is beautiful , charming, picturesque—I really can’t find enough positive adjectives. The home is lovely and very well cared for, in addition to providing all the conveniences necessary for six adults, three of them 20-somethings, and a very discriminating dog, who immediately inspected the grounds and the house, plopped down by the fountain and gave a tail wag of approval. There are gardens everywhere, and all are very private. The neighborhood is quiet, which suited us fine. Although everyone in California seems to jump into their cars for everything, we walked to the beach a few times—it is about 1 mile away. There are plenty of places to eat in Montecito and Santa Barbara, and we talked to long-time residents on the beach to get some excellent recommendations. But by far, the meals we enjoyed most where the ones we cooked in a very well outfitted kitchen and ate sitting under the heat lamp on one of the inviting patios while the sun was setting. We hiked into the mountains, rented bikes to tour Santa Barbara, watched sunsets on the beach. There are many options for outdoor activities, happy hours and socializing. There really is a lot to do in the area, and our biggest dilemma was choosing what to do, as Montecito Estancia was so inviting, we all were reluctant to leave for long periods. Elena M.
Welcome to the Estancia! Managed with excellence by owners with 9 years plus experience that shows the minute you enter to this beautiful property.